"People trust Hasids... I know how this works... In the five years that I studied Yeshiva in London, I was never asked by customs to open my bags," said ex-Hasid Luzer ("God help" in Hebrew) Twersky, age 24. Twersky's observation was ironically timed given his state when I talked to him, descending the stairs of New York City central booking. He had just spent a night behind bars for driving with a suspended license. His point, however, is still a valid one. It is central to Holy Rollers, a movie by first-time Director Kevin Asch that is loosely based on the true story of a ring of drug smuggling Hasidic Jews in the late '90s. In Holy Rollers, Jesse Eisenberg plays Sam Gold, a 20-year-old Hasid who finds himself involved in the illicit ring after his arranged marriage falls through, ostensibly because of his family's financial situation. "Relax, mind your business and act Jewish" is the simple advice offered to him before boarding a plane with a suitcase full of ecstasy. Using religious identifiers as camouflage is a concept Twersky can relate to. 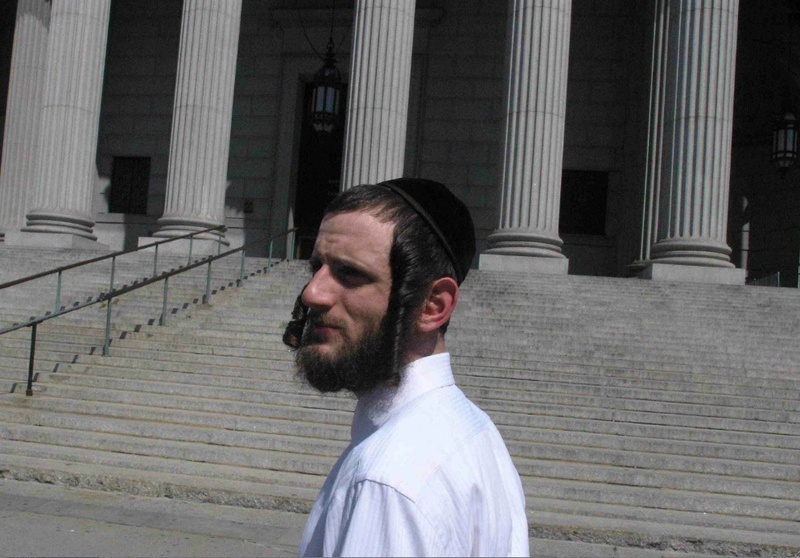 Though he left his wife and two children along with the rest of the Hasidic community almost two years ago, he still maintains his beard and payos (side curls). While Twersky's religious cloak is not being used to traffic narcotics, the motivation is the same -- disguise. "It gives me an edge in social settings... and with women," he slyly remarks. Twersky and his wife were both chaste when they wed. Since the start of his self-imposed exile, Twersky has been tempted by religiously forbidden fruits, much like Eisenberg's character in the film. He's had relationships with seven (shiksa) women, "not counting a few one night stands." While Twersky can obviously relate to the film's motif -- "The frustration with the restrictions of Hasidic life and the temptation of the outside world is something I can identify with" -- not much else about Holy Rollers' picture of Hasidic life seems accurate to him. This is something he has been quite vocal about. He engaged in a Twitter war with the film's producers after seeing the trailer. He finally confronted Asch during a Q&A session following a private screening hosted by the Consulate General of Israel. It was a debate that I found to be far more enlightening than the movie's drab 89 minutes. "The so-called Yiddish accent -- 'Baaaaah-ruck Haaashem' -- is a desperate attempt to make Hasids look like fanatics with zero intellect. It is not an accent I've heard anywhere in my life besides in bad movies," noted Twersky. The act of putting on Tefillin (a Jewish religious article used during prayer) was done incorrectly. "It's supposed to be wrapped seven times." And a scene in the synagogue that showed women and men sharing a room is not kosher in the Hasidic sphere. Twersky's gripes don't stop with the film's fallacious portrait of the religion -- for him it's personal as well. "Talk about a lawsuit," he muttered after noticing one of his friends as an unwitting "extra" in the movie. The discourse was enough to make one wonder why the film's producers didn't spring for a Hasidic or an ex-Hasidic consultant during the writing and production of the film. Strangely, the answer seems to be that they simply didn't care. "To be blunt, I created my own [reality]," was Asch's roundabout answer to Twersky's question. "In my research the lines blur and we were able to live within that blur. I always go for emotion over logic." This might have been an acceptable response if the film had in fact succeeded on an emotional level -- but the tone and characters ring false. The script, by Antonio Macia, feels like it was written by extracting a Yiddish dictionary of every Jewish cliche and folksy latke reference. The story comes as an afterthought. The portrayal of the Hasidic community is cartoonish, a "character story," as Asch offered, that makes only the most feeble attempt to get inside the head or heart of any of its characters. As a result, it's hard to say whether Holy Rollers is a bigger insult to the Hasidic community or the art of cinema. It's an experience that neither club drugs nor prayer could save. To Twersky the fact that a black hat can be deceiving is the only true insight that an audience can take away from Holy Rollers, and it's one he's not necessarily sure he wants them to have. For a man who just spent 19 hours in jail, as he had when we talked, he was in a good mood. It showed. Peyos neatly coiled, still dressed in his Hasidic garb, he excitedly updated his Twitter followers and 539 Facebook friends via Blackberry. "You guys should spend a night in central booking, it's quite an experience!" His head cocked, a smile playing on his lips: "It's been a long night. I need a coffee and a cigarette. And I've got to see my Shiksa."